Jewel-toned, natural ombre dip dyeing creates brilliant color blocks on these casual, matte silk scarves. 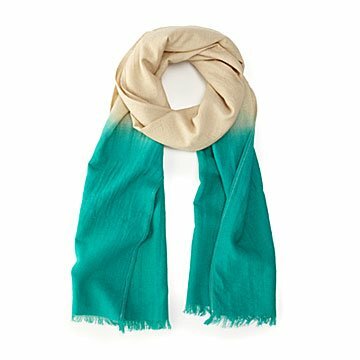 Jewel-toned, ombre dip dyeing creates brilliant color blocks on these casual, natural silk scarves. Low impact in every way but one—visually—their matte fabric has a soft hand with a rustic feel and soft drape. "Peace silk," also known as Eri, is made from vacant cocoons after the moths have emerged naturally. North Indian artisans hand-spin it, dip dye them with natural pigments, then weave them by hand on traditional bamboo looms. Finished with a bit of fringe on the ends, their medium weight silk gives these scarves year-round versatility. Handmade in India. Choose Lilac/Natural and Aquamarine/Natural (bright color blocks on each end or Coffee/Toffee (each color runs along half the scarf's length). Only at UncommonGoods. Handmade in India.